You might be shocked to here this: I’m not the toughest bloke you’ll meet. 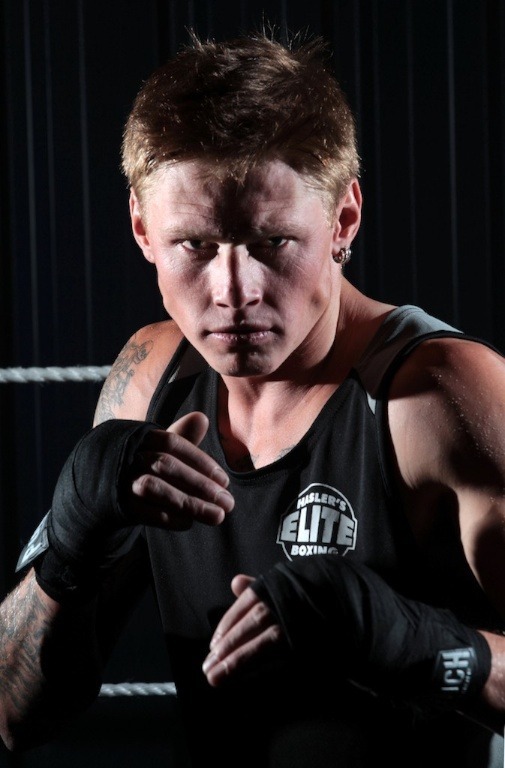 But this shadow boxer might be, so it was important my portrait of him for the Border Mail looked tough as nails. I stood the boxer in the middle of the ring, and used two flashes to sandwich him with light. Imagine two flashes about three metres apart, pointed at each other. The boxer then stood right in the middle and faced the camera. One flash was mounted to the top rope of the ring with a mixture of Gorrilapod and gaff tape and the other was held by a mate of the boxer. Manual output, power at about 1/16th. I used my 70-200mm lens, zoomed to about 150mm, flicked the autofocus point over the boxer’s head, and the autofocus mode to continuous so his eyes would stay sharp even if he moved about a bit. A few test frames later, the shutter speed was 1/200th to kill out the ambient light, and an aperture of about f9 exposed the flash nicely. Then, I just asked the boxer to punch air and I shot away. At one point, I asked the mate with the flash to come a bit closer to camera, to light the boxer’s face from the front a bit more, but, in the end, I liked this shot more. Questions, comments? Feel free to hit me up.